It is never too late to start preparing for next year, especially when it comes to staying organized at home or at the office. House of Doolittle can help you get ready for the next calendar year by stocking up on appointment books and planners for 2016. Depending on your preferred calendar style, the Monthly Planner/Journal may be a good option to keep track of major events and appointments throughout the month. The 7” x 10” size calendar is wire bound and features a black suede cover to provide a professional looking outer cover. Great for both students and professionals, the calendar has each month featured on a two-page spread. Each block size is approximately 1-3/8” x 1-3/4” and lined making it easy to write down information for each day. The weekend days are gray in color, while the week days are white, creating a visual difference on the page. Use the 100-page journal located in the back of the planner to keep track of client projects or course work. This information is vital and should be kept in the same area as your planner, in an effort to create one central place to store all information data. This Monthly Planner/Journal is the ultimate calendar since it also includes a journal ideal for writing down meeting or class notes. It is never too late in the year to become more organized in how you plan and manage information. Calendars are one of the most traditional ways to record upcoming events. Documenting a schedule in this way helps to ensure that appointments are not forgotten about. Whether it is used for work or to manage personal schedules, the House of Doolittle Monthly Planner/ Journal can help to organize this information. Available in a 7 x 10 inch size, this 12-month calendar provides room for detail when recording event specifics. The planner is wire bound with a black, suede like cover giving the calendar an overall professional look. There are 100, ruled journal pages located after the calendar pages. Having these blank pages makes it possible to take notes in meetings, write down to-do lists and even track projects completed throughout the month. The combined journal and planner feature makes this calendar even more useful then standard planners. The neutral colored calendar has two page spread for each month in addition to journal space. Spring cleaning time is here! Although your focus might be on getting your house in order, do not forget to pay attention to your office space at work. Getting rid of clutter and reorganizing is a great way to revitalize your work space for the remainder of the year. When changing up the office, take a look at how things are organized in order to determine if there is a better approach. Using a different style calendar is one simple change that might make it easier to track appointments without using desk space. Taking a look at the wall planners that House of Doolittle has might be an easy fix that has large benefits. The write-on/wipe-off feature makes it possible to update the calendar without having to mess anything up. If appointments or events get rescheduled, simply take a clean, damp cloth and wipe away the water soluble marker ink. The hangers are included with the calendar, making the set-up easy. Using the House of Doolittle’s wall planner is just one step in creating a new and improved work space. 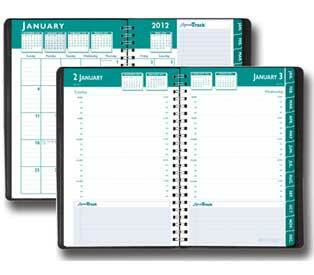 This teal, laminated wall planner can be used horizontally or vertically depending on your wall space. Even though we are almost a month into the New Year, many people are still getting back into the swing of things at work. If you have not already ordered your new 2014 calendar, now is the time to take a look at all the different styles that House of Doolittle has available to choose from. Styles, ranging from large desk pad calendars to travel size daily appointment planners, come with a variety of designs. While some display a neutral, simplistic design, others have more graphics and color used to make it more eye appealing. House of Doolittle has a calendar for everyone. For example, some individuals like to display their calendar and schedule in order to keep all appointments visible to them. These people may prefer using a wall calendar or larger laminated planner to store information. Others may travel to meet with customers a lot throughout the year. Using the weekly appointment planners is a compact option that helps keep them organized while on-the-go. What style of House of Doolittle calendars do you prefer? Let us know below! This Daily Appointment Planner displays monthly views and designates an entire page per day. Many people use various things to maintain their schedule, but using one primary calendar to document upcoming appointments and events is often the best approach. Additionally, keeping the calendar visible, helps to make your schedule accessible at all times. The Four Seasons Reversible 18-Month Wall Planner can be stored on the wall to eliminate taking up space, while still remaining in plain slight. On one side the calendar displays January through December, while the other side lists July through June. The calendar takes both a traditional and academic approach when listing the months. Each block size is 1 x 1-1/2 inches, allowing room to write upcoming events. Since this planner is not laminated, any type of writing instrument can be used on the calendar. The planner can be mounted by utilizing the self-adhesive hangers to attach it to the wall. Where would you use House of Doolittle’s 18-Month Wall Planner? Let us know below. Use this 18-month wall calendar to keep all of your important dates and appointments visible. As life gets busier, it is important to document appointments and events to ensure that nothing conflicts. However, keeping track of numerous schedules on one calendar can be tedious and sometimes, cluttered. In certain circumstances, it can be more beneficial to create different calendars for specific purposes to avoid any overlap. The House of Doolittle Economy Monthly Appointment Planners is a basic calendar that is ideal for this type of situation. Displaying a two-page monthly spread, the calendar allows an individual to be aware of what their current and upcoming schedule looks like. Each day block is numbered and lined to allow users to write in the catalog. The weekends are shaded a light gray to differentiate them from the weekdays. The Economy Calendar is available in two different sizes and is essential to tracking many people’s complex schedules. What do you use your House of Doolittle calendar for? Let us know below. The two-page spread provides room to add detail about the upcoming appointment or event. Using a calendar in day-to-day life is often supposed to be a place to manage schedules and appointment. House of Doolittle, however, takes the traditional use of calendars an extra step to become even more beneficial. The Express Track Daily/ Monthly Planner has note space that allows individuals to make notes relating to specific appointments or manage a To-Do list. In addition, the calendar also provides unique life management tips on how to prioritize tasks, which can be helpful to everyone in one way or another. The calendar itself is broken up into monthly and daily formats. The daily layout has quarterly appointments between the hours of 8 am and 5:45 pm listed. The monthly calendar is accessible by using the tabs located on the right sides of the page. The additional features to this calendar make it ideal for the ultra-organized person. Would this type of calendar be valuable to you? Comment below! Track your goals for the week in addition to your appointments with House of Doolittle's Express Track Calendar. Do you have a calendar you can keep with you as you travel for work or run errands? If not, you should! The House of Doolittle Breast Cancer Awareness Monthly Pocket Calendar makes it easy to always know when your appointments are. Whether you use it for work or personal purposes, the pocket calendar, which is 3 ¾ x 6 ¼ in size, can keep you organized. The 14-month calendar ranges from December 2011 to January 2013 and has previous/ following month references on each spread. There is one month printed per two page spread in a check book like format. Since it is a Breast Cancer Awareness calendar, it is only natural that the color scheme is pink and gray with the weekends being highlighted. Due to its size, the calendar can conveniently fit into a purse or laptop bag without taking up much room. What do you use your House of Doolittle pocket calendar for? Let us know below! The checkbook sized monthly planner is great for using when traveling or for keeping in a purse or gym bag for personal use. You are currently browsing the archives for the Monthly Planners category.